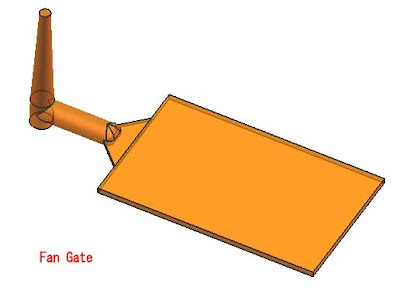 fan gate, is a gate spreading toward in to cavity, basically this gate is thin similarly with previous gate (film gate) and is used in same purpose with film gate. with the gate construction it permits rapid filling of large parts or fragile section mold area with large entry area. it is used to create uniform flow into wide parts. 1. thereby keeping the cross sectional area constant. 2. This ensures a constant and more even plastic flow into the cavity into a wide area at a slow injection speed, minimizing backfilling and reducing imperfections and stresses in the part. 3. used for thick-sectioned moldings and enables slow injection without freeze-off. 4. favored for low stress moldings or where warpage and dimensional stability are main concerns. 5.The melt velocity will be constant. 6.The entire width is being used for the flow. The gate should taper in both width and thickness, to maintain a constant cross sectional area, although at picture below thickness is doesn't tapered. the land thickness can be vary thin relative to the part thickness because the gate is very wide.the maximum thickness should be no more than 80% of the part thickness. if the parts very thin like 0,8 mm, you can also use 0.7 mm fan gate thickness, but when rubber is used as material parts, use 100 % of the thickness parts is more easy to control flow and product quality. 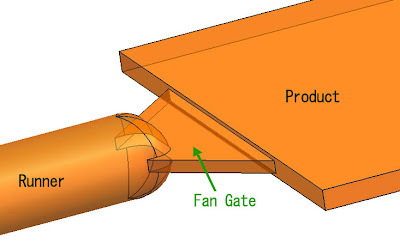 The gate width varies typically from 6 mm up to 25% of the cavity length.in large parts is often use fan gate as wide as the parts it self. 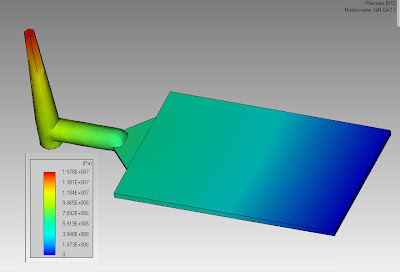 from below picture we can learn where is the best position to make cooling layout, after you make cooling layout, enter the cooling simulation process to your parts. if the distribution is same in all shape of part (unless runner and gate) your design is good to realize. all picture is enabled to enlarge, click the picture to enlarge. It's amazing how much work goes into these moldings. I'm always just so impressed with how far engineering and technology has come. I'm excited to see where it goes 10 years from now!